The (audio-) recording in the video below originally comes from a KEYS-Magazine demo CD, Issue 04 / 1996. This issue of the magazine had an extensive A-100 test (page 44-50) in it, with statements from Kraftwerk's Florian Schneider (and O. Lieb). Florian Schneider (from Kraftwerk) spoke this poem on the answering machine of Florian Anwander, who wrote for the German KEYS magazine at the time. Anwander played the cassette of the answering machine back in a Fostex 280 multitrack deck and did the vocoder recording with a straight saw wave from a Roland JX3P synthesizer as a carrier-signal. No voiced/unvoiced detector was used; instead of that he took the high frequencies of the original signal, that were later added to the output-signal. A Yamaha 2020 compressor and a noise-gate﻿ from Ashley were also used in this audiorecording. A-100 to the future! " Analog synthesis system / sonically and optically pleasing / technical, logical, functional / prototypical and special / modular and variable / Light, compact and portable / for a musical adventure / A-100, not too expensive / midi control from the computer / A-100 to the Future! 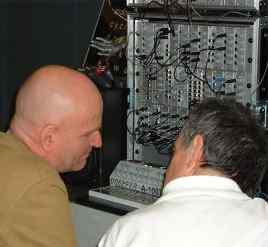 Florian Schneider, from Kraftwerk, perform a recorded test-drive of a vocoder to the Doepfer electronic instruments." " Up to now, I only had the chance to play around for one day with the A-100, but I can already say that Doepfer has built something really special. The system does sound very good and does offer everything I do expect from a modular system - and that at a really reasonable price. For me it is also a plus that it has turned out smaller than other systems, like some may point out. But the adjustors on a mixing desk are even closer together, and you can also take it with you easily and leave the expensive rarities at home. The vocoder has turned out really nice; it does really sound good in comparison to other vocoders. After building a multi-channel filter (a very important module, by the way), it was only a small step for Dieter Doepfer to combine this with VCA's and Envelope-followers. " " On a modular synth, you really learn how the sounds are made. I can advise anyone to buy a simple oscilloscope with the modular system. This was also my start, I was fascinated to see; "this is how the sound looks here and after the filter it looks like that...". You can really see principles here which you can also find in the whole world. " * The opening voice﻿ is Gia Stemmer, who did the moderation of the KEYS demo-CD.